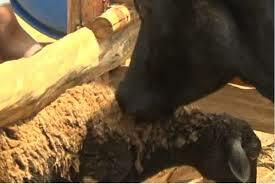 Kenyan farmer Charles Mamboleo has revealed that one of his cows has started eating sheep. The farmer at Elementaita in Gilgil constituency has expressed shock over the unusual behaviour exhibited by his cow that has “eaten” two sheep in a span of three weeks. According to the Daily Nation website, Charles Mamboleo says he discovered a cow at his farm in south-western Nakuru County feeding on a sheep one morning, having apparently gored it to death. Fresh food and water couldn’t tempt the cow, and another sheep met its end the following day, the report says. According to a Kenyan agricultural officer, while cows are herbivores, developing a taste for meat could be a sign of a nutrient deficiency. “The dry season, which has just ended, has seen most animals lack minerals found in green grass,” Albert Kabugi told the website.